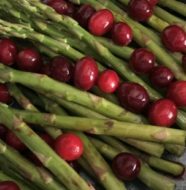 The key to Mediterranean food is fresh ingredients. And these Fish Tacos are filled to the gills with fresh veggies, like baby spinach, cucumbers, tomatoes, sweet peppers, red onion and black olives. 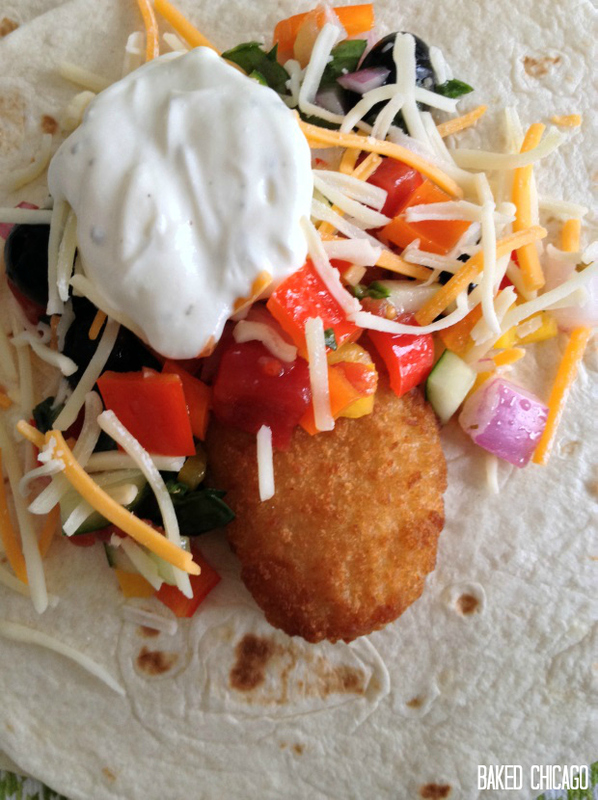 It’s like a mini farmer’s market in every flour tortilla! In a mixing bowl, combine all the prepared fresh vegetables. Drizzle generously with Italian Dressing, and gently toss to coat. You want the onions, sweet peppers, cucumber, black olives, and tomatoes to absorb all the savory herbs while you prepare the fish tenders. Cover the vegetable mixture with plastic wrap or put in a resealable container and refrigerate. Then bake your fish tenders (I like to use tilapia, but any white fish would be equally delish) according to package directions. About 5 minutes before the fish is done, start warming your flour tortillas according to package directions. Now you’re ready to assemble. 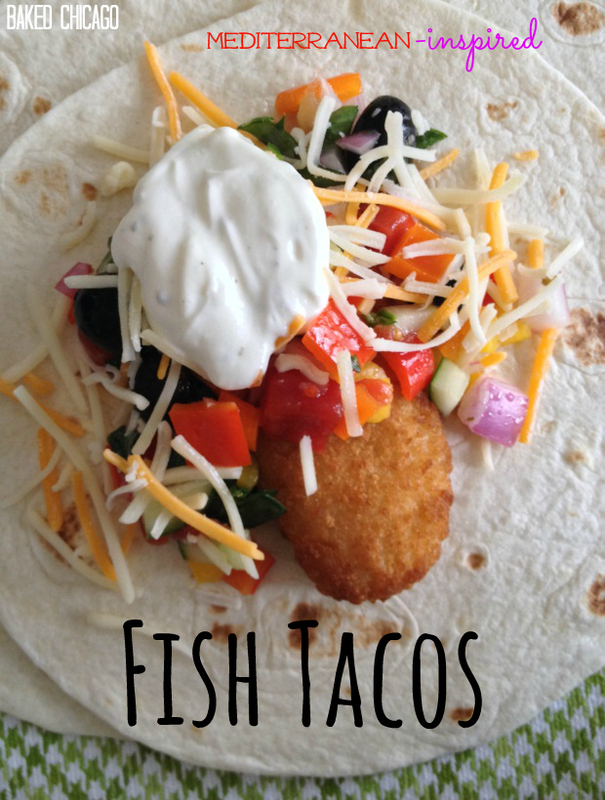 This is an easy weeknight dinner that allows everybody to customize their own fish tacos (make mine with extra cheese, please!). 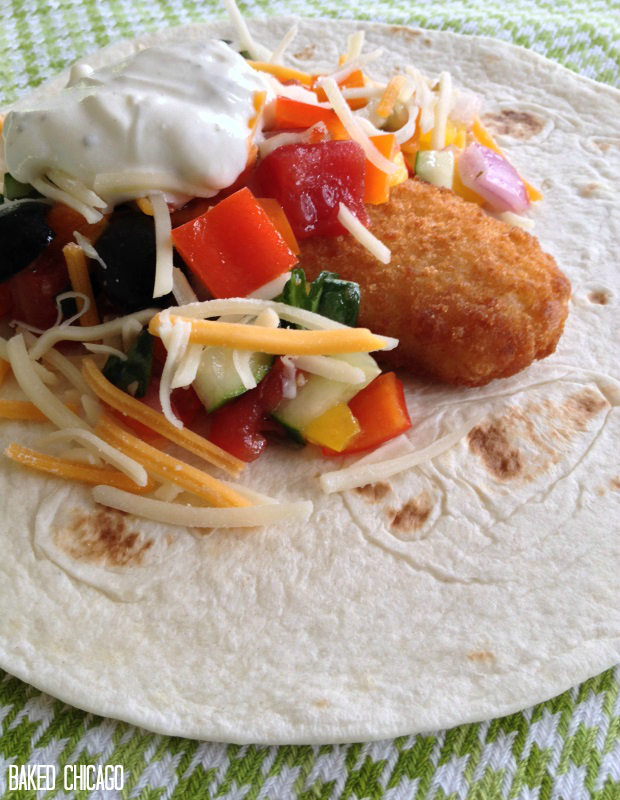 Place a fish tender in the center of the tortilla. Pile on heaping spoonfuls of veggies with Zesty Italian dressing. Sprinkle with cheese. And top it with a dollop of Classic Ranch-sour cream. 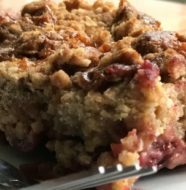 Most of the ingredients in this recipe are plug-and-play, which means use whatever fresh vegetables you’ve got in stock and your favorite shredded cheese blend. 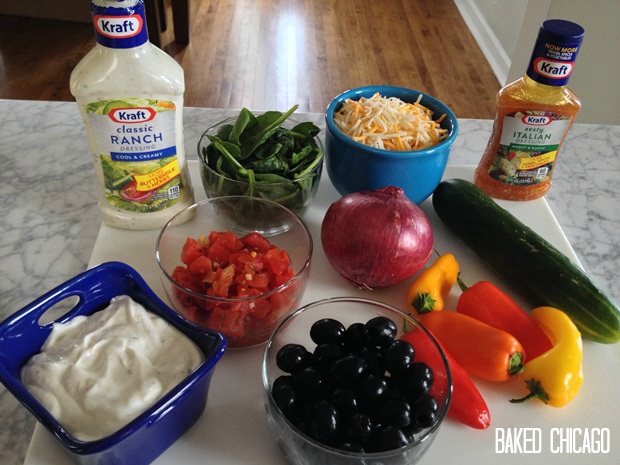 Mix together ranch dressing and sour cream in a resealable container. Refrigerate while preparing remaining ingredients. 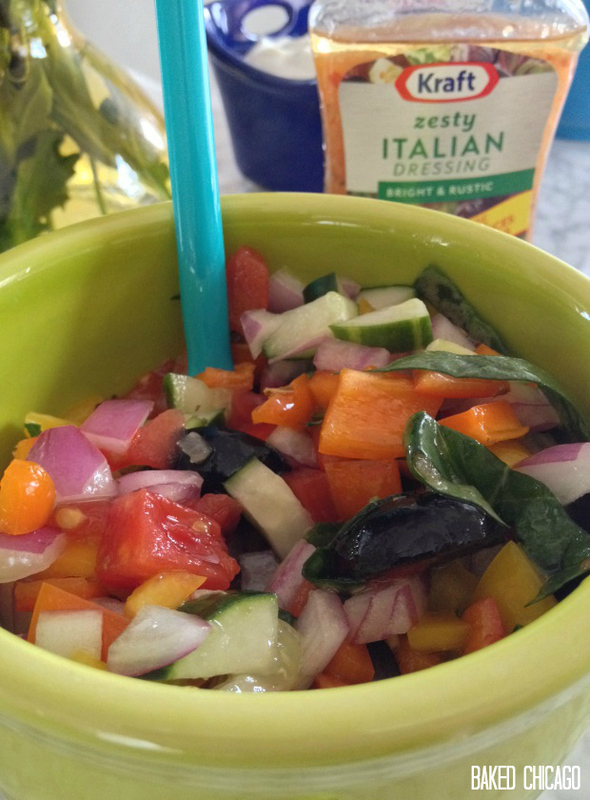 In a mixing bowl, combine cucumber, black olives, sweet peppers, red onion, baby spinach, and tomatoes. Drizzle with Italian dressing and gently toss to coat. Cover with plastic wrap and let vegetables marinate in the refrigerator while cooking fish tenders, according to package directions. Heat six flour tortillas, according to package directions. 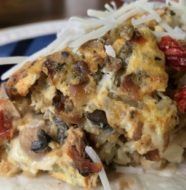 Place one fish tender on each tortilla and top with Zesty Italian vegetable mixture and a generous dollop of the Ranch dressing-sour cream mixture. Serve immediately.